In the September 2013 International Musician, I reported statistics that represented the number of streams necessary to earn a minimum wage in the US. These numbers were based on the US federal minimum wage of $7.25 per hour or $1,160 per month for a 40-hour week. Table 1 indicates how poorly streaming compared to physical sales, or even downloads, in 2013. Napster earns the number one spot as the service that pays the most to artists, at $0.019 per stream. Jay Z’s Tidal takes the number two slot at $0.0125/stream. Apple Music comes in third at $0.00735/stream. Google Play Music (GPM) logs in next with $0.00676/stream. In fifth we have Deezer, and although it doesn’t have a significant presence in the US, still pays $0.0064/stream. Spotify has improved enough to reach sixth, achieving payouts of $0.00473/stream, and in seventh place Amazon falls to $0.00402/stream. Struggling Pandora is situated at eighth, $0.00133/stream. In ninth place is YouTube, which has historically been the worst of the worst, still lagging far behind, albeit better than it was, at $0.00069. Our updated survey is based on the current average state minimum wage, which is roughly $9.20 per hour or $1,472 per month for a 40-hour week. 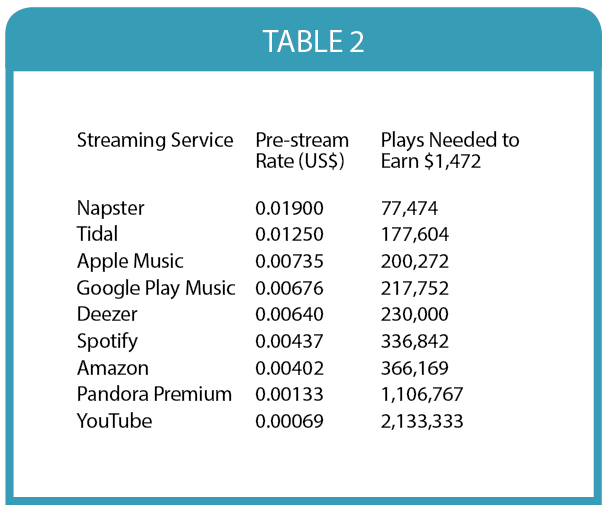 The number of streams necessary to earn that minimum from streaming services is detailed in Table 2. It’s clear from this information that artists won’t be getting rich soon through streaming services, unless they are one of the elite few. However, what is very interesting is that neither are the streaming services. In fact, they all post significant losses each year. When Spotify went public, hordes of investors were excited at the prospect of dividends from a service with 191 million active users. Once the numbers were crunched, they fled in droves, shocked by the wafer-thin margins the service operates by. Where is the money, then? At the moment, you can point to the labels. They control the catalogues that are crucial for streaming. They also have contracts with the artists that limit what they have to pay them. 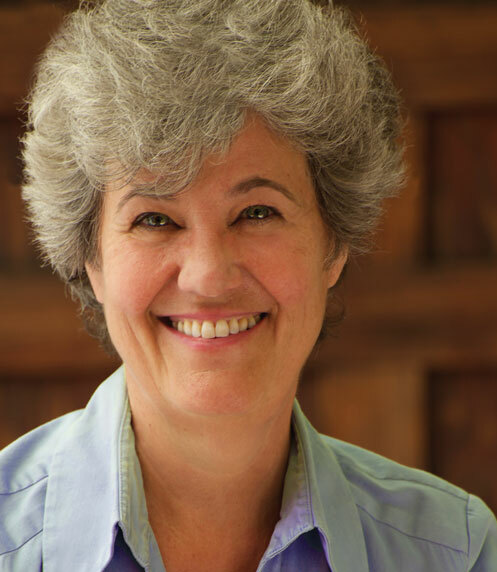 That, and the modernization of statutory royalties, means the big three labels are poised to turn record profits for some time. Financial analysts, including Fortune magazine, have published pieces about how streaming services will never turn the kind of profit they should. This is because, as the demand for the music increases, the percentage clawed back by the labels will indubitably increase. For some, specifically those controlled by the computer giants, losing money on music is no big deal, as they are simply building their customer base for other products and services. For others, such as Spotify, being the largest (by at least double) may not be enough to keep them afloat, unless they establish an even tighter alliance with the labels. Clearly, basing your career on anticipated revenue through streaming is not a great game plan. 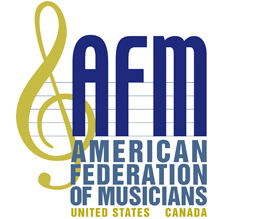 As I have iterated before, members are best served by making sure all recording is done on AFM paper, in addition to submission to the appropriate performing rights societies (PROS). 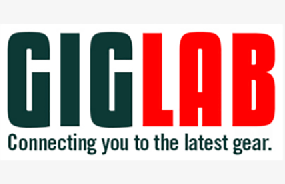 Ask your local how to file contracts and capitalize on all available revenue streams.